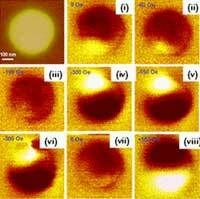 (Nanowerk News) A team of scientists from the Department of Physics at the Universitat Autònoma de Barcelona, in collaboration with colleagues from the Argonne National Laboratory (USA) and the Spintec laboratory (Grenoble, France), has for the first time produced microscopic magnetic states, known as "displaced vortex states", that will allow an increase in the size of MRAMs (which are not deleted when the computer is switched off). The research, titled "Controlling magnetic vortices through exchange bias" has been published in the Jan. 23, 2006 online edition of Applied Physics Letters. In the near future we will turn our computers on and they will be ready to work almost instantaneously; no longer will we have to wait a while for the operating system and certain programs to load into the RAM. At the moment, SRAM and DRAM do not allow this, as they are quick, but they are deleted when the computer is switched off (that is, they are "volatile"); Flash memories, which we use for digital cameras, are not deleted, but they are slow; MRAM, which is still being developed, is fast and non-volatile, but has a relatively low storage capacity. A team of scientists from the UAB Department of Physics, in collaboration with colleagues from the Argonne National Laboratory (USA) and the Spintec laboratory (Grenoble, France), have discovered a magnetic phenomenon that could be useful in the quest for the ideal type of memory: an MRAM with large storage capacity. The "displaced vortex states", first observed by UAB researchers, are small circular movements of just a few thousandths of a millimetre that form in the tiny zones where the data is stored. The information on hard drives has normally been saved by orientating these zones in specific directions. The zones pointing upwards, for example, codify a 1, and those pointing downwards a 0. The smaller and more compact these zones are, the greater the capacity of the hard drive. But if they are too close together, the magnetic field created by one can affect the neighbouring zone and wipe the data. However, if the field is saved in a whirlpool form, in "vortex state", it does not leave the tiny zone to which it is confined and does not affect the neighbouring data, thus making it possible for a much larger hard drive capacity. The scientists have achieved these "vortex states" on small, circular structures that are smaller than a micrometre (a thousandth of a millimetre) and combine layers of material with opposing magnetic properties: a layer of ferromagnetic material and a layer of antiferromagnetic material. What makes the configuration of the magnets observed by the UAB scientists new is that the vortex states are "displaced", that is, once the magnetic field is no longer applied, the eye of the whirpool moves off-centre with regard to the circular structure on which it formed. This seemingly insignificant detail is the key to applying the technique to increasing the capacity not only of hard drives but also Magnetic Random Access Memories (MRAMs) that are fast, non-volatile, but until now with small storage capacity. "The phenomenon observed could also be applied to other fields, such as improving the read heads of hard drives", according to Jordi Sort, a UAB-ICREA physicist and the coordinator of the research. "But the reason that motivated us is even more fundamental: this is a very peculiar physical state that can be observed only in extremely small magnetic structures."